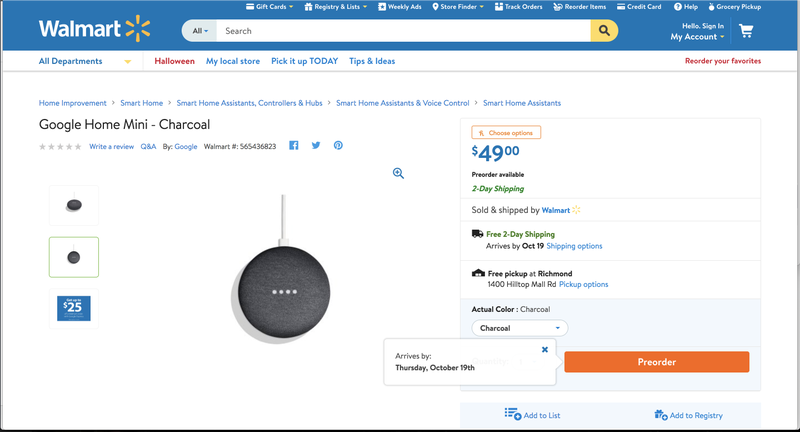 For a brief shining moment Walmart allowed anyone with a quick clicker finger to pre-order Google’s next smart speaker, the Google Home Mini. Unfortunately, that speaker isn’t expected to actually be announced until tomorrow. The speaker was available online for a glorious few minutes starting at 12pm EST/9am PST, which suggests someone maybe hit the publish button a day early—as Google’s event is expected to start tomorrow, October 4, at that same hour. This isn’t the first leak for Google’s upcoming slate of products. Two weeks ago Droid Life reported on leaks of nearly every major product expected to be announced at tomorrow’s event, including the Google Home Mini. But those leaks were primarily just pics of the devices. Thanks to Walmart we now know a little more. The box the Home Mini comes in is 4.53 x 4.53 x 4.72 inches. While we know it isn’t a perfectly square device, we can assume the Home Mini will at least be about 4-inches wide. It will weight well under a pound, and while it will go for $50, you can get it for a cool $25 at Walmart if you use Google Express to pay for the order. The page also briefly displayed what appears to be Google’s upcoming Pixel 2 XL, according to 9to5 Google. Any further details about the Home Mini (what more could you want to know?) will have to wait for tomorrow’s event, but keep your eyes peeled until then. Last year Verizon leaked Google’s whole new phone just before the event, while Amazon leaked a whole new iPhone a month earlier. Gotta love those retailers who are so eager for sales they’ll take all the wind out of the sails of some of the largest tech companies on the planet.